Home | Practice Areas | Social Security | How Does Social Security Decide If You Are Disabled? The U.S. Social Security Administration (SSA) is responsible for social security disability, and your state has social security disability offices in place to process your state’s applications. Millions of applications and requests work their way through the system each year, which is why the SSA has a structure in place to determine whether your condition is a disability. What Steps Does the SSA Take to Determine Disability? Who Reviews My Disability Claim? Who Can Qualify for Social Security Disability Benefits? What If My Condition Does Not Match the Listing Description? How Can a Good Doctor Help? The SSA defines disability differently than other government programs. To qualify for social security disability, you need to be fully disabled. Partial or short-term disability is not covered because other resources are available, like workers’ compensation or short-term disability. The SSA will verify if you are working and your income level. If you make over the monthly substantial gainful activity (SGA) threshold established by the SSA, you will not qualify for disability. If you are not working or making less than the SGA, your claim will go to the Disability Determination Services (DDS) to evaluate your medical condition. 2. Do you have a severe condition? Your impairment needs to be severe enough to interfere with your work-related activities. This determination is subjective, but in general, if your condition will last for up to a year or for the rest of your life and affect your ability to work, it is more likely to be considered severe. 3. Is your condition on the list of impairments? The SSA has a list of severe medical conditions they use to determine automatic disability. In cases where your impairment is not on the disability qualifications list, steps four and five help assess the severity of your condition. 4. Can you perform work you have done in the past? The SSA will evaluate whether or not your unlisted condition interferes with your ability to do work that you previously performed. If your condition interferes with performing tasks you were once able to complete, your claim moves to step five. 5. Can you perform other work? The SSA considers if you can complete other work. During this process, the SSA considers your age, experience, education and physical or mental ability. If you cannot adjust to other work, your disability will be approved. Local Social Security field offices, as well as state agencies, may review your disability claim. Individuals in the field office will review your personal non-medical information to ensure you meet requirements to receive social security coverage. They will verify your income, job information and living arrangements. Your claim then goes to the Disability Determination Services (DDS) to evaluate your disability. The DDS is a state agency that reviews your case to determine if your impairment qualifies as a disability under the law. Typically, DDS uses evidence they obtain independently. In some cases, they may need to get additional medical information through a consultative examination. When a consultative examination is required, you may be allowed to use your own medical physician, or you could be asked to use an independent source. If you have an appeal, your disability claim may then go to the DDS or administrative law judges in the SSA’s Office of Hearing Operations (OHO). If you appeal the initial determination, the claim will usually return to a different team in the DDS to reconsider. If, after a reconsideration, you file another appeal, an administrative law judge in the OHO will handle your case. At your claim hearing, you will have the opportunity to provide additional evidence. If the judge needs additional evidence, they may consult the DDS or your medical sources directly. The SSA provides benefits to individuals who cannot work because they have a medical condition that is expected to last at least one year or result in death. To qualify for disability benefits, you need to have worked for a job that was covered by social security. To obtain benefits, you need to have worked long enough and recently. Children under the age of 18 can also qualify for social security disability. The criteria for a child are different because the SSA does not need to consider the child’s disability to qualify them as a dependent. Benefits continue until children reach age 18. However, if they are enrolled as a full-time student in high school or elementary school, their benefits will end at age 19. To get benefits for your child after they turn 18, you will need to ensure they meet the following requirements. There are a variety of conditions, both mental and physical, that may qualify you for social security disability. The SSA List of Impairments is a compilation of the conditions for which people often seek disability requirements. The list defines which conditions qualify for disability benefits, and outlines how severe a condition must be to qualify for benefits. If you have an illness or injury, consult the current disability qualifications list to determine whether your condition qualifies. In 2018, the list of SSA Impairments for Adults includes 14 categories of disabilities. The following will help you get a better idea of the types of conditions that qualify under each impairment category on the qualifications list. The above list does not encompass all the qualifying conditions under each category. If you do not see your condition listed, you can check the adult SSA disability qualifications list. Also, the list of impairments for children under the age of 18 has additional information about qualifying conditions that are specific to children. Under each of type of impairment, an individual must meet additional requirements to qualify for social security disability. Each category has specific instructions and evidence needed to help approve your impairment as a disability. Each of these impairments may be measured differently, which is why you should do your research and speak to a lawyer when you are going through the process of filing for disability benefits. If your condition is not listed on the SSA List of Impairments, but still prevents you from working, the SSA will base their social security disability decision on a residual function capacity (RFC), which evaluates your ability to do your current job with your injury or condition. If an RFC shows you cannot do the job you did before your current diagnosis, you will need to get a medical-vocational analysis. The goal of the analysis is to find out whether you could be retrained for another job, or if there is another job you could do with your condition. If there is not, you may still qualify for disability benefits. When your condition is considered equal to a disability listing, you are just as disabled as someone who meets the definition in the listing. To equal a listing, you may need to show your condition is as severe and will have a similar duration as the listed impairment. You can qualify to equal a listing for one of the following three reasons. Listed impairment, but do not meet specific criteria: Sometimes you may have one of the impairments listed, but do not meet all the qualifying requirements. On the other hand, you can meet all the requirements, but one or more of the characteristics is not severe enough. Sometimes your symptoms or effects may be different than the requirements. A doctor or Social Security medical consultant can confirm if your conditions are of medical significance to compare to the required listing. Impairment is not listed, but related: If you have an unlisted condition that is similar to a listed impairment, you may qualify to equal the listing. Using medical records, you can help show your condition is as impairing as a listed condition. Multiple impairments: In some cases, you may suffer from multiple impairments, but none of them match a listing’s requirements. The SSA will evaluate how some of your conditions affect the severity of other impairments. If the combined effects are as disabling as a listed condition, you may equal the listing. Providing medical evidence will be crucial to equal the listing. Your doctor’s opinion will receive a significant weight in the SSA’s eyes, especially if medical information supports it. If the SSA approves your condition as equal to a listing, you will qualify to get disability benefits. You will also need to provide recent medical evidence that encompasses the time when you became disabled to the present. Medical records should provide clear evidence your condition is severe, and you are unable to perform work duties. Each condition may require unique evidence, which is why you should make sure to research the information you will need when filing your claim. 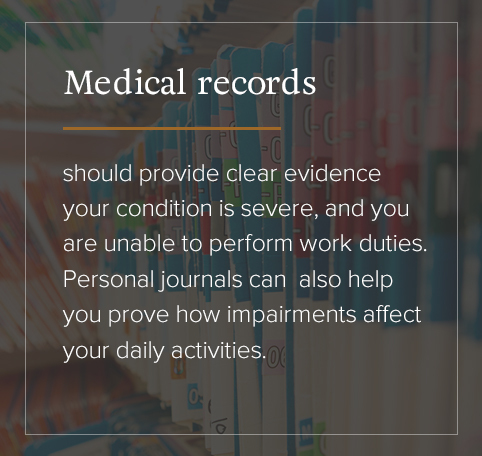 In addition to medical evidence, personal journals can help you prove how impairments affect your daily activities. Also, compiling a list of friends, family or colleagues who can attest to the impact of your condition on daily tasks can help. Make sure whatever evidence you provide is timely and recent to your condition and comes from accurate medical sources. The more medical evidence you provide, the stronger your claim will be. If you are planning to file for disability benefits, having a good doctor on your side during your claim can help with your case. Providing detailed medical evidence and statements from your physician can help prove your disability. Ensure your doctor is willing to complete necessary forms for your claim. Some doctors may charge to complete RFC forms. In other cases, your doctor may not have the time or is not willing to complete disability forms. If this is the case, you will need to find another doctor to visit multiple times to establish as your treating doctor. During your initial filing, your doctor will need to provide a statement. Prepare your doctor for this request by discussing your disability. Explain to your doctor how your disability impacts your daily routine and the extent of your disability so the doctor can convey that information in his or her statement. Verify your doctor agrees your condition qualifies as a disability. If the SSA denies your claim, your doctor is still important during the appeal process. A judge will place significant weight on a statement from your personal doctor. Showing evidence of a disability can be daunting — especially if your condition is not on the SSA official list of impairments. Speaking to a lawyer can help you understand the process of filing an appeal and the steps you need to take to prove your disability. At KBJ Injury Law, we take your injury as personally as you do. Our attorneys have more than 30 years of experience representing clients in central Pennsylvania. If you need assistance proving or appealing your disability claim, contact KBG Injury Law for a free consultation. Our attorneys would be pleased to assist you to get the results you deserve.